Oil Paint Artist's Paintstik Traditional Colors can be spread or blended and can be used in conjunction with conventional oils. 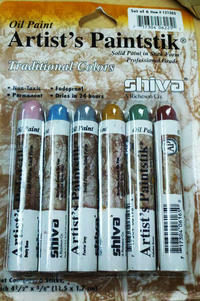 Shiva Paintstiks are self-sealing just peel the seal before using. No unpleasant odors or fumes. In most cases the paint dries in 24 hours. The regular size stick measures 5/8 inch x 4-1/2 inches long.